The Artquids or Artuqid dynasty was a Turkmen dynasty that ruled in Eastern Anatolia, Northern Syria and Northern Iraq in the eleventh and twelfth centuries. The Artuqid dynasty took its name from its founder, Zaheer-ul-Daulah Artuk Bey, who was of the Döger branch of the Oghuz and ruled one of the Turkmen atabeyliks of the Seljuk Empire. The Artuqid rulers viewed the state as the common property of the dynasty members. Three branches of the family ruled in the region: Sokmen Bey's descendants ruled the region around Hasankeyf between 1102 and 1231; Necmeddin Ilgazi's branch ruled from Mardin between 1106 and 1186 ; and the Mayyafariqin Artuqid line ruled in Harput starting in 1112, and was independent between 1185 and 1233. The Saltukids or Saltuqids were a dynasty ruling one of the Anatolian beyliks founded after the Battle of Manzikert (1071) and centered on Erzurum. The Saltukids ruled between 1071 and 1202. The beylik was founded by Emir Saltuk, one of the Turkmen commanders of the Great Seljuk Alp Arslan. The beylik fought frequently against the Georgian Kingdom for hegemony of the Kars region. The center of the beylik, Erzurum, was occupied by the Byzantine Empire between 1077 and 1079, and was besieged by the Georgian King Giorgi III in 1184. It comprised the entirety of present-day Erzurum and Bayburt provinces, lands east of Erzincan, most of Kars, and lands north of Ağrı and Muş provinces during its height. The Ahmadilis, also known as the Atabegs of Maragheh, were a local dynasty who ruled from the early 12th century until 1208–09 in Maragheh itself and in Rūʾīn Dez for some years after the Mongol conquest. They ruled approximately from 1122 to 1220. A Persianate society is a society that is based on or strongly influenced by the Persian language, culture, literature, art and/or identity. Sabuktigin's son, Mahmud of Ghazni, declared independence from the Samanid Empire  and expanded the Ghaznavid Empire to the Amu Darya, the Indus River and the Indian Ocean in the East and to Rey and Hamadan in the west. Under the reign of Mas'ud I, the Ghaznavid dynasty began losing control over its western territories to the Seljuq dynasty after the Battle of Dandanaqan, resulting in a restriction of its holdings to modern-day Afghanistan, Pakistan (Punjab and Balochistan). In 1151, Sultan Bahram Shah lost Ghazni to the Ghurid king Ala al-Din Husayn. Mahmud of Ghazni was the first independent ruler of the Ghaznavid dynasty, ruling from 998 to 1030. At the time of his death, his kingdom had been transformed into a extensive military empire, which extended from northwestern Iran proper to the Punjab in the Indian subcontinent, Khwarazm in Transoxiana, and Makran. 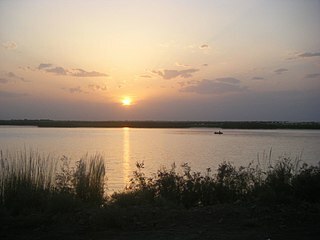 The Amu Darya, also called the Amu or Amo River, and historically known by its Latin name Oxus, is a major river in Central Asia. It is formed by the junction of the Vakhsh and Panj rivers, in the Tigrovaya Balka Nature Reserve on the border between Tajikistan and Afghanistan, and flows from there north-westwards into the southern remnants of the Aral Sea. In ancient times, the river was regarded as the boundary between Greater Iran and Turan. The Indus River is one of the longest rivers in Asia. Originating in the Tibetan Plateau in the vicinity of Lake Manasarovar, the river runs a course through the Ladakh region of Jammu and Kashmir, India towards the Gilgit-Baltistan region of Pakistan and the Hindukush ranges, and then flows in a southerly direction along the entire length of Pakistan to merge into the Arabian Sea near the port city of Karachi in Sindh. It is the longest river and national river of Pakistan. Two military families arose from the Turkic slave-guards of the Samanid Empire, the Simjurids and Ghaznavids, who ultimately proved disastrous to the Samanids. The Simjurids received an appanage in the Kohistan region of eastern Khorasan. The Samanid generals Alp Tigin and Abu al-Hasan Simjuri competed for the governorship of Khorasan and control of the Samanid Empire by placing on the throne emirs they could dominate after the death of Abd al-Malik I in 961. His death created a succession crisis between his brothers. A court party instigated by men of the scribal class — civilian ministers rather than Turkic generals — rejected the candidacy of Alp Tigin for the Samanid throne. Mansur I was installed instead, and Alp Tigin prudently retired to south of the Hindu Kush, where he captured Ghazna and became the ruler of the city as a Samanid authority. The Simjurids enjoyed control of Khorasan south of the Amu Darya but were hard-pressed by a third great Iranian dynasty, the Buyid dynasty, and were unable to survive the collapse of the Samanids and the subsequent rise of the Ghaznavids. The Simjurids were a Turkic family that served the Samanid emirs of Bukhara in the 10th century. They played an influential role in the history of eastern Iran and southern Afghanistan during that time, and by the second half of the 10th century they had built a semi-independent principality in Khurasan. An appanage or apanage or French: apanage is the grant of an estate, title, office, or other thing of value to a younger male child of a sovereign, who would otherwise have no inheritance under the system of primogeniture. It was common in much of Europe. Bukhara is a city in Uzbekistan. Bukhara is rich in historical sites, with about 140 architectural monuments. The nation's fifth-largest city, it had a population of 247,644 as of 31 August 2016. People have inhabited the region around Bukhara for at least five millennia, and the city has existed for half that time. The mother tongue of the majority of people of Bukhara is Tajik. Located on the Silk Road, the city has long served as a center of trade, scholarship, culture, and religion. UNESCO has listed the historic center of Bukhara as a World Heritage Site. After the death of Sabuktigin, his son Ismail claimed the throne for a temporary period, but he was defeated and captured by Mahmud in 998 at the Battle of Ghazni. In 997, Mahmud, another son of Sebuktigin, succeeded the throne,  and Ghazni and the Ghaznavid dynasty have become perpetually associated with him. He completed the conquest of the Samanid and Shahi territories, including the Ismaili Kingdom of Multan, Sindh, as well as some Buwayhid territory. By all accounts, the rule of Mahmud was the golden age and height of the Ghaznavid Empire. Mahmud carried out seventeen expeditions through northern India to establish his control and set up tributary states, and his raids also resulted in the looting of a great deal of plunder. He established his authority from the borders of Ray to Samarkand, from the Caspian Sea to the Yamuna. The wealth brought back from the Mahmud's Indian expeditions to Ghazni was enormous, and contemporary historians (e.g. Abolfazl Beyhaghi, Ferdowsi) give glowing descriptions of the magnificence of the capital and of the conqueror's munificent support of literature. Mahmud died in 1030. Mahmud left the empire to his son Mohammed, who was mild, affectionate and soft. His brother, Mas'ud, asked for three provinces that he had won by his sword, but his brother did not consent. Mas'ud had to fight his brother, and he became king, blinding and imprisoning Mohammed as punishment. Mas'ud was unable to preserve the empire and following a disastrous defeat at the Battle of Dandanaqan in 1040, he lost all the Ghaznavid lands in Iran and Central Asia to the Seljuks, plunging the realm into a "time of troubles". His last act was to collect all his treasures from his forts in hope of assembling an army and ruling from India, but his own forces plundered the wealth and he proclaimed his blind brother as king again. The two brothers now exchanged positions: Mohammed was elevated from prison to the throne, while Mas'ud was consigned to a dungeon after a reign of ten years and was assassinated in 1040. Mas'ud's son, Madood, was governor of Balkh, and in 1040, after hearing of his father's death, he came to Ghazni to claim his kingdom. He fought with the sons of the blind Mohammed and was victorious. However, the empire soon disintegrated and most kings did not submit to Madood. In a span of nine years, four more kings claimed the throne of Ghazni. In 1058, Mas'ud's son Ibrahim, a great calligrapher who wrote the Koran with his own pen, became king. Ibrahim re-established a truncated empire on a firmer basis by arriving at a peace agreement with the Seljuks and a restoration of cultural and political linkages. Under Ibrahim and his successors the empire enjoyed a period of sustained tranquility. Shorn of its western land, it was increasingly sustained by riches accrued from raids across Northern India, where it faced stiff resistance from Indian rulers such as the Paramara of Malwa and the Gahadvala of Kannauj. He ruled until 1098. Masud III became king for sixteen years, with no major event in his lifetime. Signs of weakness in the state became apparent when he died in 1115, with internal strife between his sons ending with the ascension of Sultan Bahram Shah as a Seljuk vassal. Bahram shah defeated his brother Arslan for the throne at the Battle of Ghazni in 1117. Coinage of Mas'ud I of Ghazni, derived from Shahi designs, with the name of Mas'ud in Arabic. The Ghaznavid sultans were ethnically Turkish, but the sources, all in Arabic or Persian, do not allow us to estimate the persistence of Turkish practices and ways of thought amongst them. Yet given the fact that the essential basis of the Ghaznavids’ military support always remained their Turkish soldiery, there must always have been a need to stay attuned to their troops’ needs and aspirations; also, there are indications of the persistence of some Turkish literary culture under the early Ghaznavids (Köprülüzade, pp. 56–57). The sources do make it clear, however, that the sultans’ exercise of political power and the administrative apparatus which gave it shape came very speedily to be within the Perso-Islamic tradition of statecraft and monarchical rule, with the ruler as a distant figure, buttressed by divine favor, ruling over a mass of traders, artisans, peasants, etc., whose prime duty was obedience in all respects but above all in the payment of taxes. The fact that the personnel of the bureaucracy which directed the day-to-day running of the state, and which raised the revenue to support the sultans’ life-style and to finance the professional army, were Persians who carried on the administrative traditions of the Samanids, only strengthened this conception of secular power. 2nd reign second son of Mahmud Raised to the throne following the removal of Masud I.
married Mamunid ruler Ma'mun II. http://www.iranicaonline.org/articles/ghaznavids Table 1. Genealogical chart of the Ghaznavid rulers. C.E. Bosworth, The Ghaznavids:994-1040, Edinburgh University Press, 1963. ↑ "Persian Prose Literature." World Eras. 2002. HighBeam Research. (3 September 2012);"Princes, although they were often tutored in Arabic and religious subjects, frequently did not feel as comfortable with the Arabic language and preferred literature in Persian, which was either their mother tongue—as in the case of dynasties such as the Saffarids (861–1003), Samanids (873–1005), and Buyids (945–1055)—or was a preferred lingua franca for them—as with the later Turkish dynasties such as the Ghaznawids (977–1187) and Saljuks (1037–1194)". ↑ Turchin, Peter; Adams, Jonathan M.; Hall, Thomas D (December 2006). "East-West Orientation of Historical Empires". Journal of World-systems Research. 12 (2): 223. ISSN 1076-156X . Retrieved 16 September 2016. ↑ Böwering, Gerhard; Crone, Patricia; Mirza, Mahan (January 1, 2012). The Princeton Encyclopedia of Islamic Political Thought. Princeton University Press. pp. 410–411. ↑ Islamic Central Asia: an anthology of historical sources, Ed. Scott Cameron Levi and Ron Sela, (Indiana University Press, 2010), 83;The Ghaznavids were a dynasty of Turkic slave-soldiers..., "Ghaznavid Dynasty" Encyclopædia BritannicaJonathan M. Bloom, Sheila Blair, The Grove Encyclopedia of Islamic Art and Architecture, Oxford University Press, 2009, Vol.2, p.163, Online Edition, "Turkish dominated mamluk regiments...dynasty of mamluk origin (the GHAZNAVID line) carved out an empire..."
↑ J. Meri (Hg. ), Medieval Islamic Civilization: An Encyclopedia, "Ghaznavids", London u.a. 2006, p. 294: "The Ghaznavids inherited Samanid administrative, political, and cultural traditions and laid the foundations for a Persianate state in northern India. ..."
↑ Sydney Nettleton Fisher and William Ochsenwald, The Middle East: a history: Volume 1, (McGraw-Hill, 1997); "Forced to flee from the Samanid domain, he captured Ghaznah and in 961 established the famed Persianate Sunnite Ghaznavid empire of Afghanistan and the Punjab in India". ↑ Meisami, Julie Scott, Persian historiography to the end of the twelfth century, (Edinburgh University Press, 1999), 143. Nizam al-Mulk also attempted to organise the Saljuq administration according to the Persianate Ghaznavid model..
↑ B. Spuler, "The Disintegration of the Caliphate in the East", in the Cambridge History of Islam, Vol. IA: The Central islamic Lands from Pre-Islamic Times to the First World War, ed. by P.M. Holt, Ann K.S. Lambton, and Bernard Lewis (Cambridge: Cambridge University Press, 1970). pg 147: One of the effects of the renaissance of the Persian spirit evoked by this work was that the Ghaznavids were also Persianized and thereby became a Persian dynasty. ↑ Ghaznawids, B. Spuler, The Encyclopedia of Islam, Vol II, Ed. B. Lewis, C. Pellat and J. Schacht, (Brill, 1991), 1051. ↑ Encyclopædia Iranica, "Ghaznavids", by C. Edmund Bosworth. December 15, 2001. Accessed July 3, 2012. ↑ The Development of Persian Culture under the Early Ghaznavids, C. E. Bosworth, Iran, Vol. 6, (1968), 40. ↑ C.E. Bosworth, The Ghaznavids:994–1040, (Edinburgh University Press, 1963), 224. ↑ C.E. Bosworth, The Ghaznavids:994–1040, 225. ↑ Houtsma, Martijn Theodoor (1987). E.J. Brill's first encyclopaedia of Islam, 1913–1936. 2. BRILL. p. 151. ISBN 978-90-04-08265-6 . Retrieved 24 September 2010. ↑ "Afghan and Afghanistan". Abdul Hai Habibi . alamahabibi.com. 1969. Retrieved 2012-07-01. ↑ Wink, André (2002). Al-Hind: The Slavic Kings and the Islamic conquest, 11th-13th centuries (illustrated, reprint ed.). BRILL. p. 428. ISBN 978-0-391-04174-5 . Retrieved 22 June 2016. ↑ Lewis, Bernard (1992). The World of Islam. London: Thames and Hudson. p. 205. ISBN 978-0-500-27624-2. ↑ C.E. Bosworth, "Ghaznavids" in Encyclopaedia Iranica , Online Edition 2012. ↑ The Development of Persian Culture under the Early Ghaznavids, C.E. Bosworth, Iran, Vol. 6, (1968), 44. ↑ Jocelyn Sharlet, Patronage and Poetry in the Islamic World: Social Mobility and Status in the Medieval Middle East and Central Asia, (Tauris Academic Studies, 2011), 46. ↑ Ghaznavids, E.K. Rowson, Encyclopedia of Arabic Literature, Vol.1, Ed. Julie Scott Meisami and Paul Starkey, (Routledge, 1998), 251. ↑ Jocelyn Sharlet, Patronage and Poetry in the Islamic World: Social Mobility and Status in the Medieval Middle East and Central Asia, 27. ↑ Jocelyn Sharlet, Patronage and Poetry in the Islamic World: Social Mobility and Status in the Medieval Middle East and Central Asia, 52. ↑ The Theme of Wine-Drinking and the Concept of the Beloved in Early Persian Poetry, E. Yarshater, Studia Islamica, No. 13 (1960), 44. ↑ Brian Spooner and William L. Hanaway, Literacy in the Persianate World: Writing and the Social Order, (University of Pennsylvania Press, 2012), 284. ↑ Hail to Heydarbaba: A Comparative View of Popular Turkish & Classical Persian Poetical Languages, Hamid Notghi and Gholam-Reza Sabri-Tabrizi, British Journal of Middle Eastern Studies, Vol. 21, No. 2 (1994), 244. ↑ C.E. Bosworth, The Ghaznavids:994–1040, (Edinburgh University Press, 1963), 132. ↑ The Institution of Persian Literature and the Genealogy of Bahar's "Stylistics", Wali Ahmadi, British Journal of Middle Eastern Studies, Vol. 31, No. 2 (Nov. 2004), 146. ↑ The Past in Service of the Present: Two Views of History in Medieval Persia, J. S. Meisami, Poetics Today, Vol. 14, No. 2, Cultural Processes in Muslim and Arab Societies: Medieval and Early Modern Periods (Summer, 1993), 247. ↑ The Development of a Literary Canon in Medieval Persian Chronicles: The Triumph of Etiquette, E. A. Poliakova, Iranian Studies, Vol. 17, No. 2/3 (Spring – Summer, 1984), 241. ↑ The Development of Persian Culture under the Early Ghaznavids, C.E. Bosworth, Iran, Vol. 6, (1968), 36. ↑ C.E. Bosworth, The Ghaznavids 994–1040, (Edinburgh University Press, 1963), 134. ↑ Ghaznavids, Homyra Ziad, Medieval Islamic Civilization, Ed. Josef W. Meri, (Routledge, 2006), 294. ↑ Muzaffar Alam, Françoise Delvoye Nalini and Marc Gaborieau, The making of Indo-Persian Culture: Indian and French Studies, (Manohar Publishers & Distributors, 2000), 24. ↑ Brian Spooner and William L. Hanaway, Literacy in the Persianate World: Writing and the Social Order, 284. ↑ C.E. Bosworth, The Ghaznavids 994-1040, (Edinburgh University Press, 1963), 44. ↑ C.E. Bosworth, The Later Ghaznavids, 22–24. ↑ C.E. Bosworth, The Later Ghaznavids, (Columbia University Press, 1977), 45. ↑ C.E. Bosworth, The Later Ghaznavids, 90. ↑ C.E. Bosworth, The Later Ghaznavids, 93–95. ↑ C.E. Bosworth, The New Islamic Dynasties, (Columbia University Press, 1996), 297. Wikimedia Commons has media related to Ghaznavid Empire . Ethé, Karl Hermann (1911). "Persia" . In Chisholm, Hugh. Encyclopædia Britannica . 21 (11th ed.). Cambridge University Press. pp. 187–252. Ghazni historically known as Ghaznin or Ghazna, is a city in central Afghanistan with a population of around 270,000 people. The city is strategically located along Highway 1, which has served as the main road between Kabul and southern Afghanistan for thousands of years. Situated on a plateau at 2,219 metres (7,280 ft) above sea level, the city is 150 km south of Kabul and serves as the capital of Ghazni Province. Abu’l-Fadl Muḥammad ibn Ḥusayn Bayhaqī, better known as Abu'l-Fadl Bayhaqi, was a Persian secretary, historian and author. The Saffarid dynasty was a Muslim Persianate dynasty from Sistan that ruled over parts of eastern Iran, with its capital at Zaranj. Khorasan, Afghanistan and Sistan from 861 to 1003. One of the first indigenous Persian dynasties to emerge after the Arab Islamic invasions, its founder was Ya'qub bin Laith as-Saffar, who was born in 840 in a small town called Karnin (Qarnin), which was located east of Zaranj and west of Bost, in what is now Afghanistan - a native of Sistan and a local ayyār, who worked as a coppersmith (ṣaffār) before becoming a warlord. He seized control of the Sistan region and began conquering most of Iran and Afghanistan, as well as parts of Pakistan, Tajikistan and Uzbekistan. Abu Mansur Sabuktigin, also spelled as Sabuktagin, Sabuktakin, Sebüktegin and Sebük Tigin, was the founder of the Ghaznavid dynasty, ruling from 367 A.H/977 A.D to 387 A.H/997A.D. In Turkic the name means beloved prince. The Khwarazmian dynasty (; also known as the Khwarezmid dynasty, the Anushtegin dynasty, the dynasty of Khwarazm Shahs, and other spelling variants; from was a Persianate Sunni Muslim dynasty of Turkic mamluk origin. The dynasty ruled large parts of Central Asia and Iran during the High Middle Ages, in the approximate period of 1077 to 1231, first as vassals of the Seljuqs and Qara-Khitan, and later as independent rulers, up until the Mongol invasion of Khwarezmia in the 13th century. The dynasty spanned 2.3 million square kilometers. Ahmad Sanjar was the Seljuq ruler of Khorasan from 1097 until in 1118 when he became the Sultan of the Seljuq Empire, which he ruled as until his death in 1157. The Ghurids or Ghorids were a dynasty of Iranian descent from the Ghor region of present-day central Afghanistan, but the exact ethnic origin is uncertain. The dynasty converted to Sunni Islam from Buddhism, after the conquest of Ghor by the Ghaznavid sultan Mahmud of Ghazni in 1011. Abu Ali ibn Muhammad was the first Muslim king of the Ghurid dynasty to construct mosques and Islamic schools in Ghor. Alp-Tegin, was a Turkic slave commander of the Samanid Empire, who would later become the semi-independent governor of Ghazna from 962 until his death in 963. Muhammad of Ghazni was sultan of the Ghaznavid Empire briefly in 1030, and then later from 1040 to 1041. He ascended the throne upon the death of his father Mahmud in 1030. He was the younger of a set of twins; this circumstance resulted in civil strife. His reign lasted five months before he was overthrown by his twin Ma'sud I, after which he was blinded and imprisoned. Nine years later he was reinstated for a year before being slain by his nephew Maw'dud. According to Ferishta, his reign lasted only 50 days before he was blinded and imprisoned on the order of Ma'sud I. A year later he was murdered by his nephew Maw'dud. The Khalaj people are primarily classified as a Turkic people likely of Indo-Iranian origin that speak the Khalaj language. They can be classified as Persian people as well, due to becoming largely Persianized in the mid 20th century and also identifying as such. Their local language has preserved some features of Old Turkic lost in other Turkic languages. The language also has much Persian influence. Mas'ud I of Ghazni, known as Amīr-i Shahīd, was sultan of the Ghaznavid Empire from 1030 to 1040. He rose to power by seizing the Ghaznavid throne from his younger twin Mohammad, who had been nominated as the heir upon the death of their father Mahmud of Ghazni. His twin was shortly blinded and imprisoned. However, when much of Mas'ud's western domains had been wrested from his control, his troops rebelled against him and reinstated Mohammad to the throne. Muhammad ibn Suri was the king of the Ghurid dynasty from the 10th-century to 1011. During his reign, he was defeated by the Ghaznavid emperor Mahmud of Ghazni and his domains were conquered. According to Minhaj-us-Siraj, Muhammad was captured by Mahmud of Ghazni, made prisoner along with his son, and taken to Ghazni, where Muhammad died by poisoning himself. Subsequently, the whole population of Ghuristan was taught the precepts of Islam and converted from Mahayana Buddhism to Islam. Mu'izz ad-Din Muhammad of Ghor later overthrew the Ghaznavid Empire in 1186 and conquered their last capital at Lahore. Chaghri Beg, Da'ud b. Mika'il b. Saljuq, also spelled Chaghri, was the co-ruler of the early Seljuq empire. The name Chaghri is Turkic and literally means "small falcon", "merlin". Abuʾl-Ḥasan al-Qāsim Aḥmad ibn Ḥasan Maymandī, better known as Ahmad Maymandi, and also known by his honorific title of Shams al-Kufat, was a Persian vizier of the Ghaznavid Sultan Mahmud of Ghazni and the latter's son Mas'ud I of Ghazni. Abu'l-Hasan Ali ibn Fadl ibn Ahmad Isfaraini, better simply known as Abu'l-Hasan Isfaraini, was a Persian vizier of the Ghaznavid Sultan Mahmud of Ghazni from 998 to 1010. Abu'l-Muzaffar Khusrau Malik ibn Khusrau-Shah, better simply known as Khusrau Malik, was the last Sultan of the Ghaznavid Empire, ruling from 1160 to 1186. He was the son and successor of Khusrau-Shah. Arslan Isra'il, also known as Arslan Yabgu was a Turkic chieftain, who was from the Kınık tribe, which would later establish the Seljuk Empire. His name Arslan means "the lion". Ghazni is a city in southeastern Afghanistan, which served as the capital of the Ghaznavid Empire from 977 to 1163.